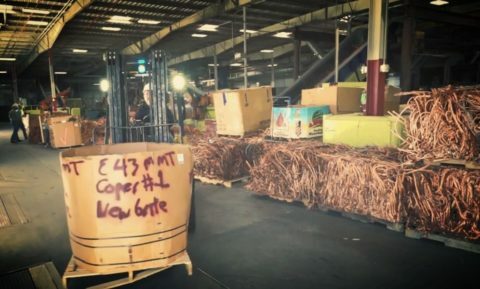 Whether you’re a Procurement Manager, Facility Operations Manager, Journeyman or other professional, you might have asked the question, how is copper recycled? Not only is recycling copper a quick and easy process when you partner with the right distributor, but it’s a way for you reduce waste, expedite job site clean-up, and help the environment – all in one sweep. By properly handling the many pollutants in copper wire and cable that would otherwise eventually break down and contaminate the ground and fresh water, the right distributor partner is the key to a cost-effective and environmentally friendly recycling program. Did you know copper is nearly 100 percent recyclable? More than half of the copper consumed in the U.S. is from recycled scrap. Almost 80 percent of copper produced in the world is still in use, and it can continue to be recycled without any changes to its properties. In fact, it retains 95 percent of its original value. By coordinating with the right distributor to recycle copper, industry professionals can decrease the amount of scrap material on any job site. Border States, for example, makes the recycling process quick, easy and affordable. Recyclers are interested in high-purity copper scrap. Once received, it’s processed through a chopping line, which granulates the insulated wire, allowing copper to be liberated from any insulation. The granulated material will cross a screener, then a density separator, capturing recovered copper chops that will later undergo a quality inspection before being transported to a rod mill for consumption. Copper is then processed through a proprietary recycling area, which helps ensure the metal is contaminant-free, and provides an optimal finished product for efficient melting at the rod mill. Scrap is then loaded into a furnace, melted, casted and rolled into 5/16 rod. The rod is then used to make building wire.